Sunday afternoon I will be at the oceanfront. 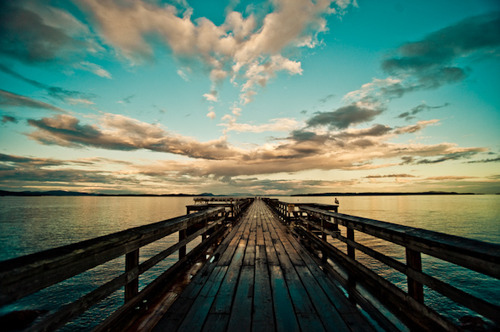 Standing on a fishing pier. I won’t be there for pleasure nor will I be there to fish. My Uncle Dale, who passed away recently, requested that his ashes be scattered in the ocean where he loved spending his time. He was 69 years old and one of 6 siblings. My Dad is one of his brothers. I remember my Uncle Dale living with us once upon a time when I was in high school. He was a character. I truly adored him. He was the funny guy in the house that would distract my feelings of anxiety during the times that my mother drank the heaviest. He certainly witnessed many an argument between her and I.
He’d hear me crying at night after everyone had gone to sleep and he’d knock on my door and say “Come on, Princess….let’s play a game of Rummy”. We’d sit up at the dining room table with oldies playing low in the background and he’d shuffle and deal. Looking back, I know he was not only distracting me with a card game but all through the game we’d talk about my Mom and my Dad. How they both loved me but my mother was in the clutches of Mr. Bacardi Rum and my Dad was trying his best to provide for his family. His father was an alcoholic and he understood how painful it was for me. He was my favorite uncle. I could tell him anything that bothered me and I wasn’t judged and it never got back to my parents. He was my friend. I went off and got married (the first time…which only lasted a couple years….another post about that…another time) at 19 and he moved to New Orleans. I didn’t see him again but we wrote from time to time and he kept in contact with my parents regularly. He moved back to the area 8 years ago and I was elated to see him. A much older Uncle Dale but still the same fun-loving character that I knew and loved. I remember spending some holidays with him and then I guess life got in the way. He got a job further out-of-town and we heard from him randomly but not as often. During the time that he got sick 3 years ago my mother and I were in and out of estrangement and I didn’t realize how sick he actually was nor was I clued in. I got an email from my Dad the day he left us. THE DAY HE DIED. When I saw his name as the title of the email that came through I felt sick. I prayed before I opened it that it wasn’t going to be bad news. It was horrible news. And I got it via cyber pigeon. I was upset that this was how I learned about my favorite uncle passing away. After 8 months of silence, my mother called the next day. We’ve been speaking ever since. I’ve spoken briefly on how I feel about not knowing until the last min but I’m trying not to harbor resentment. I can’t live in that place in my head. However…there is no rewind button and I can’t go back and say goodbye. I realize some of this is on me as well since I didn’t keep up with him and life got in the way. I think it happens to all of us. And then we are faced with loss and regret. I’m comforted by knowing that he knew I loved him. And I have saved letters and pictures from a time long ago that I can smile through tears and remember who taught me to play Rummy. I was good at it too! You’ll be missed, Uncle Dale!